The IBM 3290 is a high-function, large capacity, plasma-panel display station that attaches to a 3274 Control Unit. A member of the 3270 Display System family, the 3290 provides for the display of up to 9,920 alphanumeric characters in multiple-screen format options for use in entering data into and retrieving data from S/370 Processors, 4300 Processors, 9370 Processors and 8100 Information Systems. Displays up to 9,920 characters -- 62 lines of 160 characters each. Characters are displayed within a 5x8 character matrix. Alternate display of up to 5,300 characters -- 50 lines of 106 characters each. Larger characters displayed within a 7x9 character matrix. Multiple partitions (up to 16). Note: Entry assist is not supported with the Katakana Language. Note: Customer modifiable keyboards are not supported with the Katakana language. Note: String and block copy is not supported with the Katakana language. Note: RTM historical data stored in the 3274 Control unit cannot be viewed with a 3290 Information Panel but can be viewed by other authorized terminals attached to the Control unit. The 3290 Information Panel attaches to a 3274 Control unit utilizing one physical port and up to five addresses, depending on the application. Up to 31 3290's can be attached to a 3274 depending on the application and 3274 model being used. The 3290 Information Panel attaches with the same coax cable that is used with other Category A terminals to attach to a 3274 Control Unit. Note: The 3290 Model T30 requires a triax to coax adapter which must be supplied by the customer. The 3290 Information Panel Display Station provides a high level of visual display function for the IBM 3270 user. 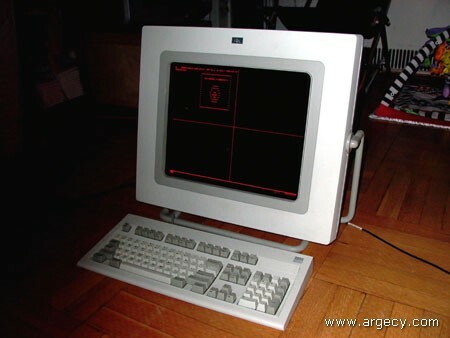 A member of the 3270 family, the 3290 incorporates a flat plasma panel as its display medium to provide a large capacity display for alphanumeric data and graphic images. The image displayed is orange on a black background and is uniform at every point of the viewing area. The 3290 uses microcode loaded from the 3274 Control Unit, to provide screen management facilities for improved operator usability. The 3290 is data-stream compatible with all models of today's 3270 displays in alphanumeric application environments and complements the 3270 product family by extending 3270 capability to include large screen and multiple screen application usage. Its flat panel allows compact packaging and provides a versatile display station. A high-function, large capacity, plasma-panel display station that attaches to a 3274 Control Unit. A member of the 3270 Display System family, the 3290 provides for the display of up to 9,920 alphanumeric characters in multiple-screen format options for use in entering data into and retrieving data from S/370 Processors, 4300 Processors, 9370 Processors and 8100 Information Systems. IBM On-Site Repair warranty service is provided under the Agreement For Purchase of IBM Machines and is available 24 hours a day, 7 days a week. IBM On-Site Repair Maintenance Service is available under the IBM Maintenance Agreement at the applicable Minimum Maintenance Charge. The base period of Maintenance Service availability is 7 AM to 6 PM, Monday through Friday. Optional periods of Maintenance Service are available for additional charges. To obtain this service a customer calls the IBM Service/Exchange Communication Center on the National Toll-free Number (800)428-2569. Once customer problem determination is completed, an IBM Customer Engineer will be dispatched to repair the failing unit. There is no regularly scheduled preventive maintenance recommended by IBM on these units. If an IBM maintenance agreement is not contracted for immediately following expiration of the service and parts warranty, and the customer subsequently wants maintenance coverage, the customer must have an IBM customer engineer inspect the machine. A minimum charge for the inspection, cleaning, and testing will be applied. In addition, all time and parts required to qualify the machine for maintenance agreement acceptability will be billed at IBM's then current rates and terms. The machine will then qualify for IBM maintenance agreement coverage. If, on the basis of the inspection, IBM concludes that the machine is not repairable, no further work will be performed and a minimum charge will be applied. Adequate site, system, and other vendor preparation. Receipt at customer's receiving dock, unpacking, and placement of unit. Physical setup, connection of cables in customer access areas, switch settings, and checkout. Notify IBM of intent to relocate and follow IBM instructions for relocation. Assuring that for the 3290 Model T30, the coaxial cable attachment and triax to coax adapter to the 3274 control unit also satisfies the electromagnetic data security requirements of Federal Specification NACSIM 5203. The adapter must be supplied by the customer. Specify 3274 Load Diskette For US M&S (#9301). For AP, Canada, IBM LA #9301 (except Katakana) or #9305 (Katakana, Models 220 and 230 only). Note: Since this feature code diskette is used to support the 3290 Model 001, 3290 Model 220/230/T30, and 3179 Model G, customers should read the diskette label to verify that the 3290 code is at Level D41.00 or higher which supports both models 1 and 220/230/T30. These feature codes must be ordered against the 3274, NOT the 3290. A 3178, 3179, 3278 or 3279 Display Station with a keyboard must be attached to Port 0 of the control unit as a diagnostic unit. Power line cord: 2.8m (9.0 ft) nonlocking plug for Models 220 and 230. 1.8m (6.0 ft) filtered nonlocking plug for Model T30. Note: City of Chicago specify #9511 for 1.8m (6 ft) for Models 220 and 230 only. Both a 6-foot and a 9-foot cable will be supplied. Not available for Model T30. Keyboard Language: All machines will have English US keyboards. Keyboard Types: The second character of the AAS model number specifies which keyboard will be supplied. Number 2 specifies a standard keyboard and number 3 specifies a keyboard with an attached numeric keypad. Data/Typewriter Keyboard (Model 220): The 3290 Model 220 has a low-profile, customer-modifiable, EBCDIC typewriter-like keyboard with adjustable keyboard slope and coiled cable. There are 24 Program Function keys located in two rows across the top of the keyboard. Overlays are provided to permit users to identify functions assigned to these keys. Refer to the appropriate product publications for the keyboard layout. Corequisite: None. Maximum: One keyboard can be attached at a time. Field Installation: Yes. (CSU) See "Field Keyboard Change" for descriptions. Data/Typewriter Keyboard with Integrated Numeric Pad (Model 230): The same keyboard as the Data/Typewriter keyboard described above but with 18 additional keys located to the right side of the keyboard in a calculator-like layout. Refer to the appropriate product publications for the keyboard layout. Corequisite: None. Maximum: One keyboard can be attached at a time. Field Installation: Yes. (CSU) See "Field Keyboard Change" for descriptions. Data/Typewriter Keyboard with integrated Numeric Keypad (Model T30): The same keyboard layout as the Model 230 keyboard described above but which is not customer modifiable. Field Installation: Yes. (CSU) See "Field Keyboard Change" for descriptions. Model 220/230 Keyboards are Customer Modifiable: The keyboard layouts may be changed by using the 3290 Model 220/230/T30 utility diskettes supplied with the 3274 Control Unit. Keyboards may be modified using the keyboard labels and new keycap kits. See "Keyboard Accessories" for kit descriptions. The keyboard modification function is explained in the "IBM 3290 Description and Reference Manual", GA23-0021. Field Keyboard Change: If a new keyboard is required by a customer after the equipment is delivered, it may purchased and ordered: For US M&S through Branch Office via AAS MSORDER using part numbers listed below. For AP, Canada, IBM LA by Parts and supplies requisition using part numbers listed below. IBM shielded twisted-pair cable (or equivalent) or coaxial cable is required for product attachment. Cable and associated accessories can be purchased from IBM or a customer-selected source. The customer is responsible for installation and maintenance of the cable and associate accessories. Twisted pair cable - For proper identification, installation and application of cable and associated accessories, refer to "IBM Cabling System - Planning and Installation Guide", GA27-3361. For pricing and ordering information refer to For US M&S the appropriate IBM DIRECT catalog. For AP, Canada, IBM LA, the Systems Supplies operation with your country. Coaxial cable - For proper identification, installation, and application of cable and associated accessories, refer to "IBM 3270 Installation Manual - Physical Planning", (GA27-2787) For AP, Canada, IBM LA, and "Coaxial Cable and Associated Manual", (GA27-2805). The 3290 Model T30 is provided with a six foot triax (RG22) communications cable. A correct adapter for attaching the triax to coaxial cable must be provided. Contact your IBM Marketing Representative for further details. The 3290 is shipped with two keys for the keylock. Additional keys may be purchased from IBM. Key identification number must accompany each order. Key identification number can be found on the keylock. Supply both the key code and part number from the chart below for each key order. Order through Branch office parts station and/or field parts distribution centers to FED Greencastle or the customer can place orders directly to the IBM parts order center in Greencastle.